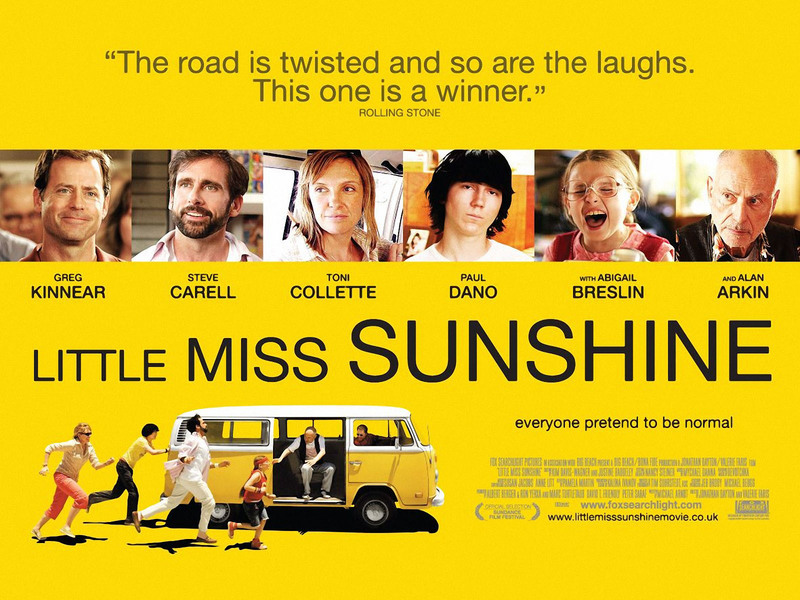 Little Miss Sunshine is a black comedy about one family’s journey to get the youngest, Olive to a beauty pageant in California, some 1000 miles away, in only two days. The story revolves around the families’ problems, including suicide, money and disappointment whilst holding strong for Olive, to get her to her dream contest. Along the way, the family experience the death of foul-mouthed Grandpa, and Olive’s brother Dwayne’s world crashing down on him when realising he cannot pursue his dream job, all in one rather worn out VW campervan. Actors include Steve Carell (40 year old virgin), Toni Collette (About A Boy), and Abigail Breslin (Signs). A rather A-lister cast, but the actors fit the charecters perfectly. Displaying a normal, realistic family’s charecteristics in a great preformance, with realistic emotions, that of a real family. The cast set to the characters I feel were perfectly fitted. Tired looking parents, a crazy grandpa, an awkward uncle, a silent, moody teenager and little naive Olive ignoring the problems and getting on with her dream. I feel this aspect creates a sense of hope and compassion for the family, wanting everything to go well, but alas, everything goes wrong. But wrong doesn’t always mean bad; in this case the ending supplies you with a hilarious conclusion, which at first would seem to be the complete opposite of what the family and you wanted, but actually turns out to be the best possible way to end the journey.